I'm sure those of you who read this blog regularly are tired of hearing me rave about Vivid Lacquer, but you'll have to suffer through another review today. Anni is very generously offering minis for bloggers to review, so I had to jump at the chance. 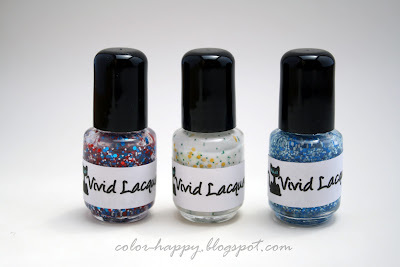 Vivid Lacquer Paint Me Patriotic, Daisy, and Ocean's Pixels. Paint Me Patriotic is a variety of red, white, and blue glitters in a clear base. Again, the glitter is fairly dense and I had no problem getting a little of everything on the brush. And here's something I didn't realize before I got the polish: this one has stars in it! They appear fairly often without any fishing required. I honestly didn't expect to love this one as much as I do. Daisy is a white jelly with white diamond glitter, small round green glitter, and matte yellow hexes. There's also a teeny bit of gold shimmer in the base. It's subtle enough to be hard to photograph and is not immediately apparent, but it adds an overall richness to the polish that a plain white jelly wouldn't have. The formula on this was great. It went on a little streaky but it self levels if not applied too thinly. I used two coats over Sally Hansen Insta-Dri Jade Jump. This one is really gorgeous and is definitely my favorite of the bunch. It's soft and delicate and pairs so well with other colors. Ocean's Pixels is a clear base with small blue and pale green matte glitter. This went on very smoothly and the glitter is fairly densely packed so it doesn't take much. You could probably get full or nearly full coverage in a few coats. This is one coat over Revlon Buttercup. Vivid Lacquer can be found on Etsy. Thanks both of you! I don't think I'll be continuing the chain, but I really appreciate the thought!